Welcome to the Lego Star Wars: The Force Awakens Gold Bricks locations guide that shows you how to find and unlock the total of 250 Gold Bricks locations for the PS4, PS3, Xbox One, Xbox 360, Wii U, PC, Mac, 3DS, PS Vita & iOS Mobile action-adventure game. 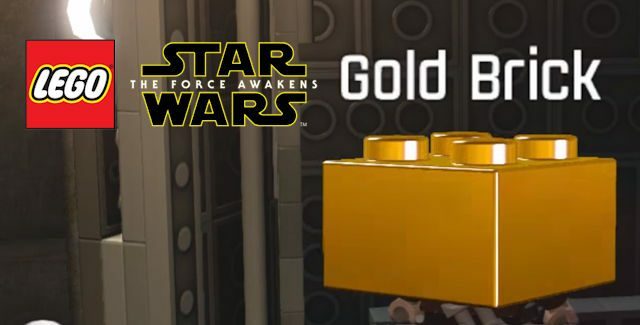 As a bonus, finding all 250 Gold Brick locations, and picking up these shiny yellow/gold colored LEGO bricks, will help towards unlocking the New Star Wars Adventure Bonus Levels and getting 100% completion. Tip: Go and buy the “Collectible Detector” Red Brick first. It’s already unlocked automatically from the start, you can buy it for 500,000 studs, since there is no cheat code to get it faster. It’ll make it a lot easier to find all the remaining Gold Bricks when they are being pointed out to you with an on-screen yellow arrow. Beat a level in Story Mode to get a Gold Brick. You get 1 for each of the 12 chapters & 6 adventure levels, so 18 Gold Bricks in all. Satisfy a level’s True Jedi stud requirement during Story Mode or Free Play Mode. At 1 per level, that’s another 18 Gold Bricks in the main Story chapters and new Star Wars Adventure levels. – Our “Lego Star Wars: The Force Awakens Walkthrough” shows the stud requirements per level and how to finish all levels. Collect all 10 Minikits from a level (can be done in Free Play mode) for a Gold Brick reward. That’s 18 Gold Bricks again. – Our “Lego Star Wars: The Force Awakens Minikits Locations Guide” points you to them all. Collect all 35 Carbonite Bricks in the open world HUBs. – Our “Lego Star Wars: The Force Awakens Carbonite Bricks Locations Guide” shows with every one you find you immediately get a Gold Brick as well, 35 Gold Bricks in total. Where to find all Gold Bricks in Lego Star Wars: The Force Awakens? The in-game collectibles locations for the Gold Bricks are described in these detailed video guides. Huge thanks to Trophygamers, AFGuidesHD & Joe for the gold brick location guide videos and tips. Please check our at the top listed Lego Star Wars: The Force Awakens guides for tips to find 100% of the collectibles.